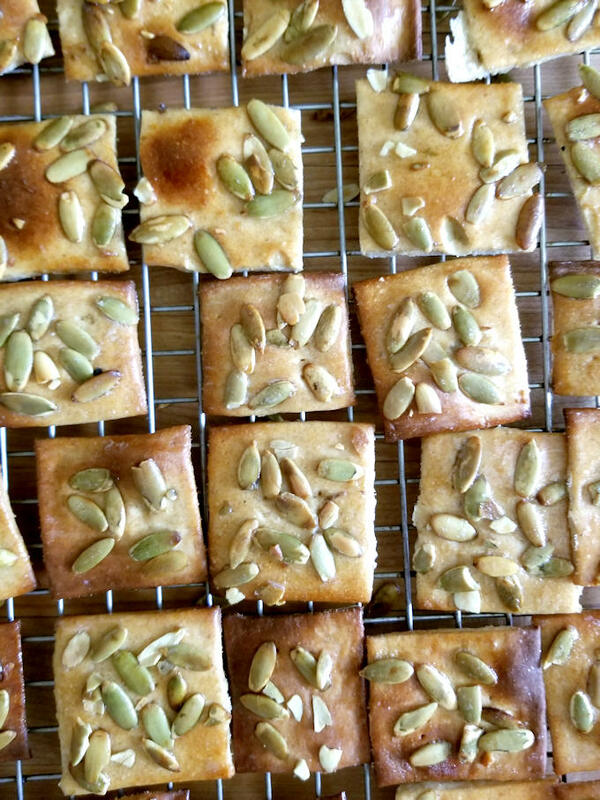 These Pumpkin Seed Crackers are crispy, crunchy and hearty, yet they are surprisingly light. A cracker is a bread that acts like a cookie. 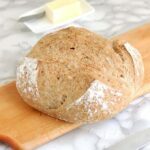 What starts out as a fairly typical whole wheat bread dough, turns into thin, bite-size morsels that are the perfect, healthy snack. See, I can do a “healthy” recipe every once in a while. 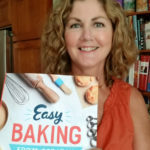 While I love making cakes, pies and cookies, we all know that those are more “every once in a while” treats. 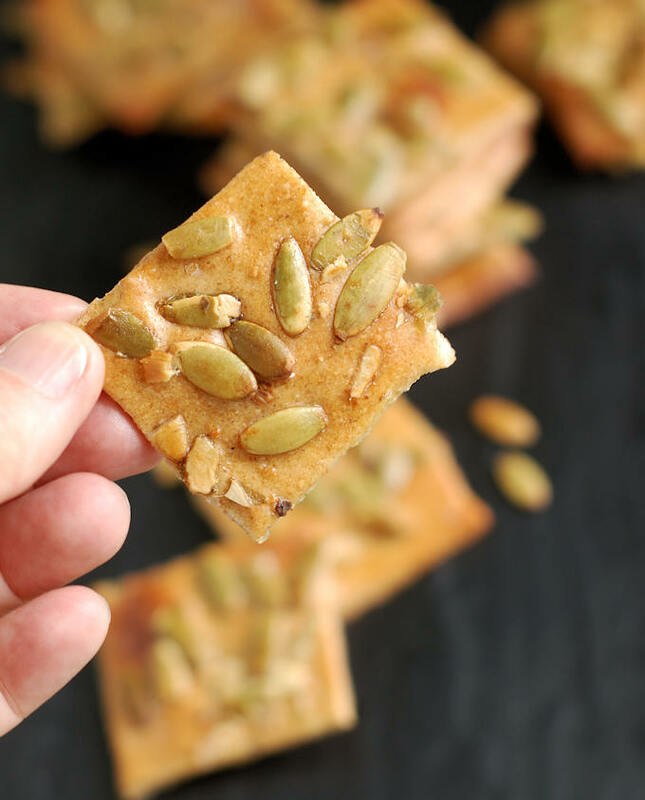 Pumpkin Seed Crackers are very low in fat and sugar and they’re made with a healthy dose of whole grain. 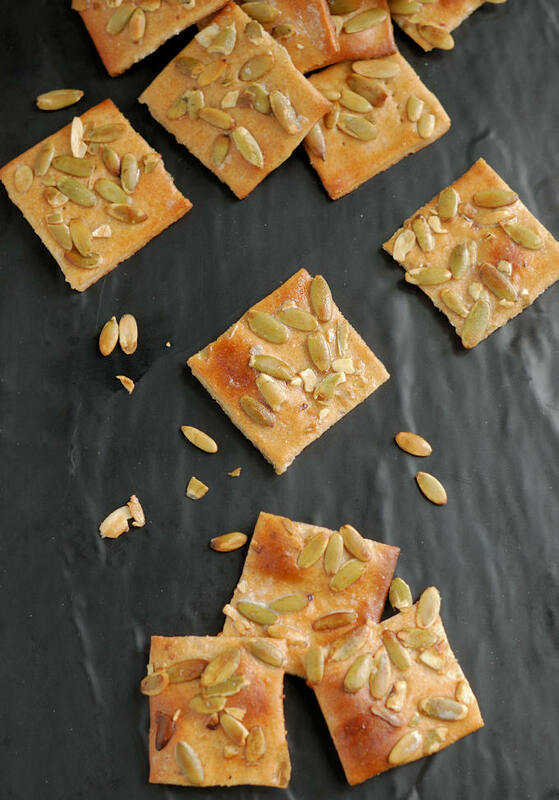 The savory pumpkin seeds on top amp-up the flavor and nutrition. 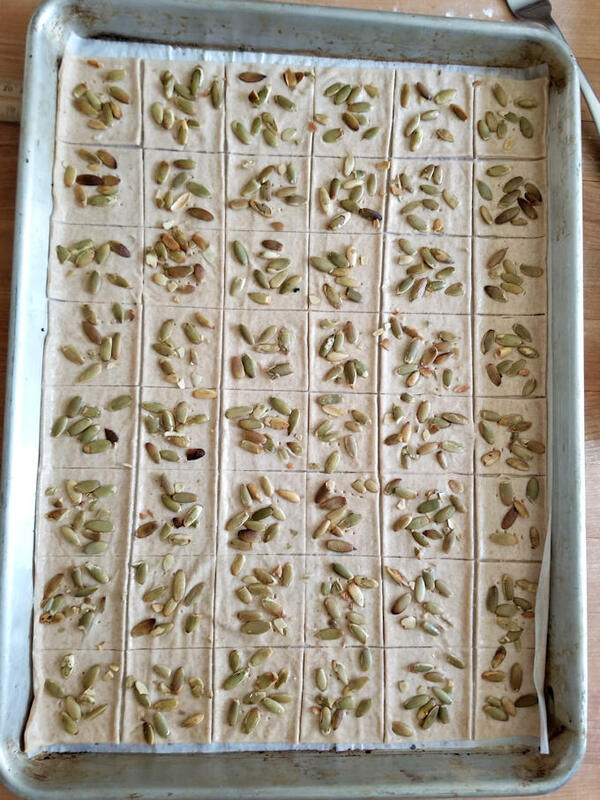 As you can see in the process photos, Pumpkin Seed Cracker dough is mixed and risen like a regular bread dough. 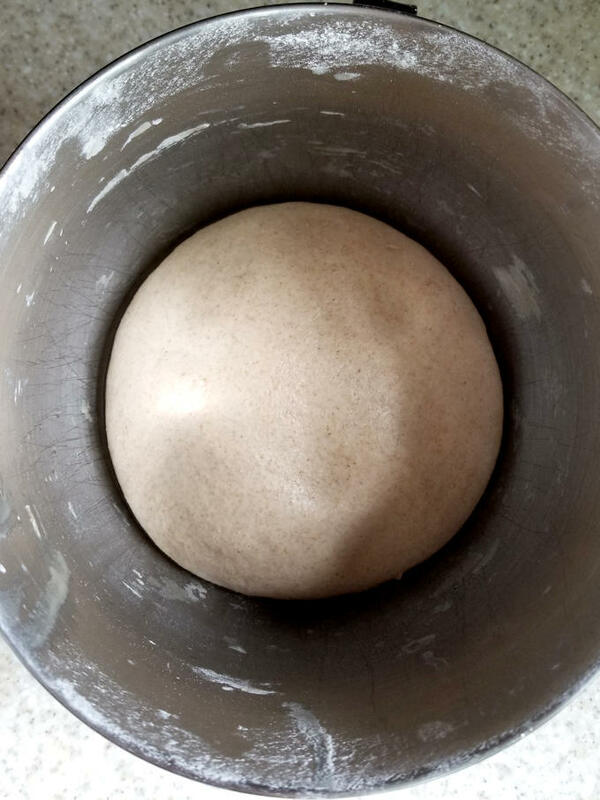 If I took this dough and formed it into a baguette or boule (ball) it would probably make a nice, crusty whole-wheat loaf. 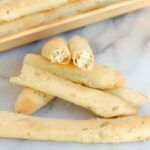 How do we turn a bread dough into crackers? First of all I started with a lean dough, meaning there is very little fat in the recipe. A high fat dough would be softer than a lean dough. Although I often use more sugar to make cookies nice and crisp, I didn’t want the crackers to be sweet. 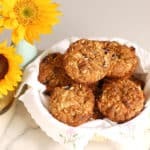 There’s just a hint of honey in the dough to perk up the whole wheat flavor. The key to making a crunchy cracker is to roll the dough incredibly thin. 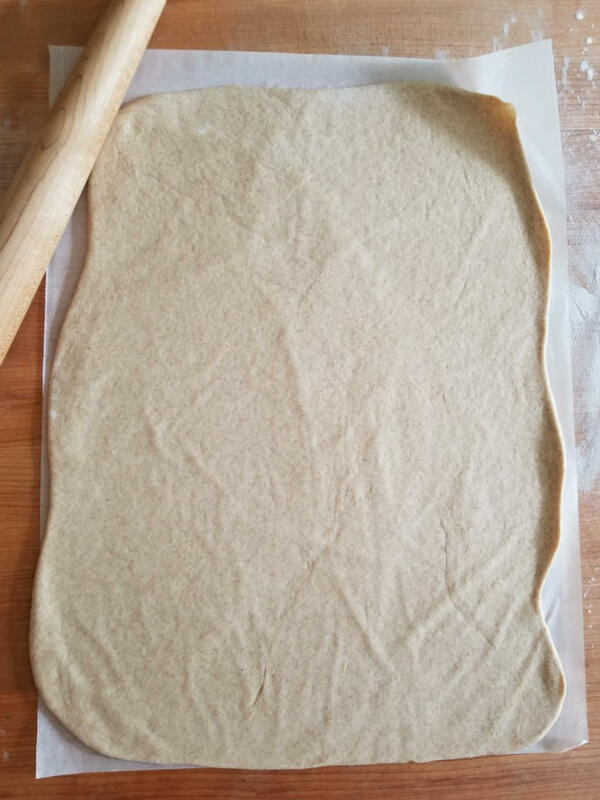 I’ve found that the easiest way to do this is to start rolling the dough on a floured surface and then finish on a sheet of parchment paper. The dough will lightly stick to the parchment, which makes it possible to roll the dough really, really thin. Less than 1/8″ thick is good, closer to a 1/6″ is even better. 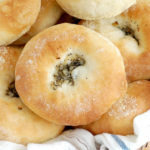 If you have one, you could use a pasta roller to to roll dough. 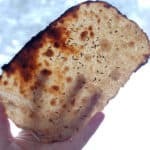 That’s how I made my ultra-thin Sourdough Rye Crispbreads. 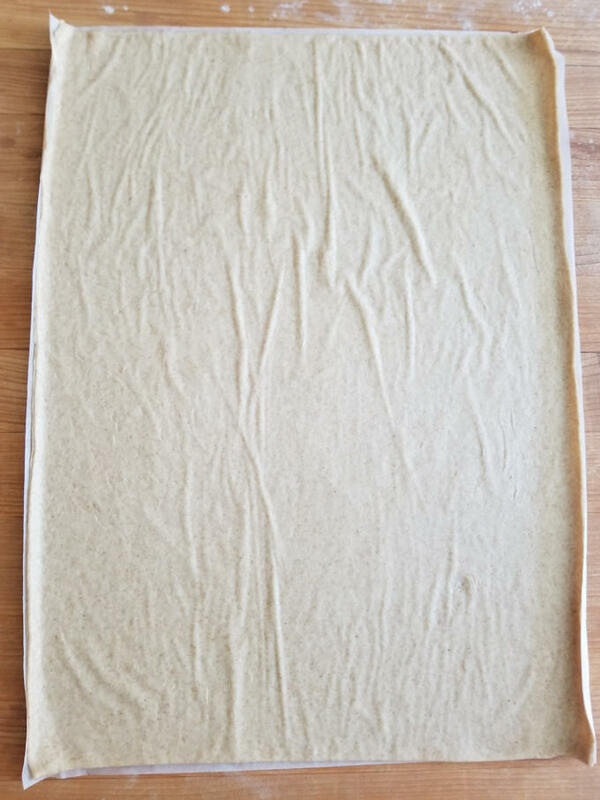 Once the dough is about 1/4″ thick, transfer it to parchment paper to finish rolling. 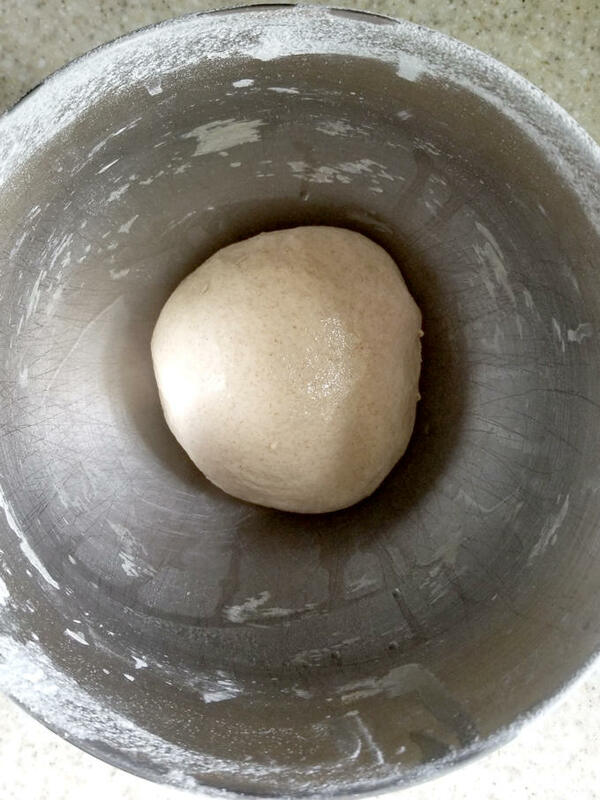 The dough should be less than 1/8″ thick. 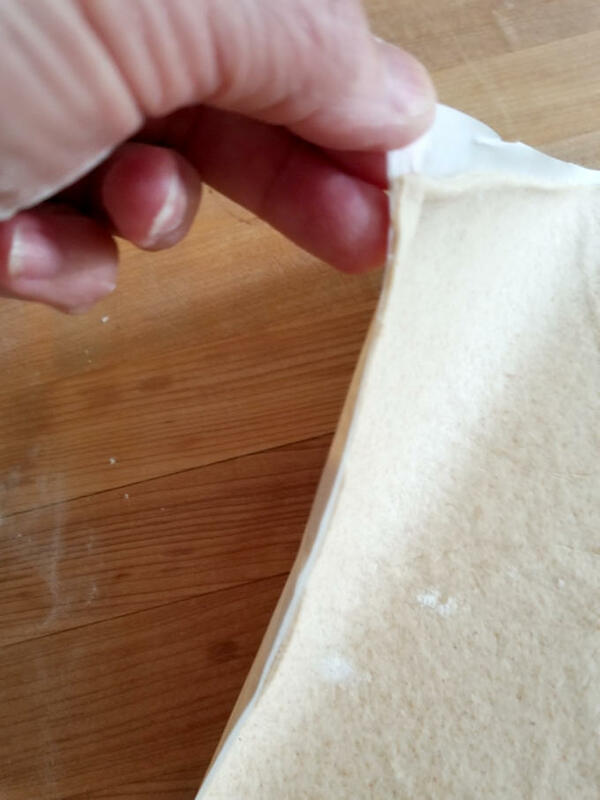 Trim the edges of the dough to form a neat rectangle the same size as the parchment. The first time I tested this recipe I put the crackers into the oven as soon as they were rolled and cut. The first batch had a nice flavor, but they were quite dense and a little chewy. I wanted my crackers to be a little light and crisp. For the second test I let the crackers rise while the oven preheated. Although the dough didn’t look puffy and airy, that 30 minute rise was enough for the yeast to lighten the dough. The crackers puffed just a bit in the oven, creating the light & crisp texture I was after. 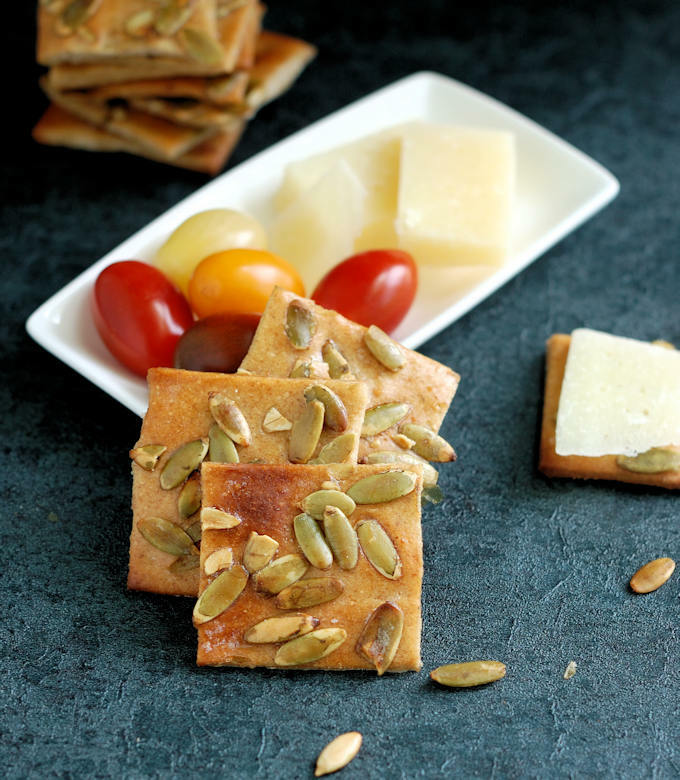 Cut the crackers with a pizza cutter, brush with egg whites and sprinkle with seeds. Allow the dough to rise while the oven preheats. As soon as the crackers come out of the oven brush them with melted butter for a tasty finish. I only keep unsalted butter in the house since that’s what I use for baking. But I think this would be a good time to use salted butter. 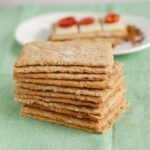 It would be the perfect finishing touch for these irresistible crackers. I would like to tell you exactly how long these crackers stay fresh. But the truth is that my husband and I (mostly my husband, I swear) ate almost the whole batch in two days. Embarrassing, but true. 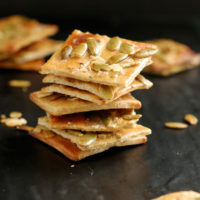 Crisp, hearty crackers covered with savory pumpkin seeds. These light and crispy crackers are a healthy and tasty snack. In a mixer bowl combine the water, honey, 2 tablespoons melted butter, salt and yeast. Add the wheat flour and 1 cup of the all purpose flour. Mix to form a thick batter. Beat 3 minutes on medium speed. Remove the paddle attachment. 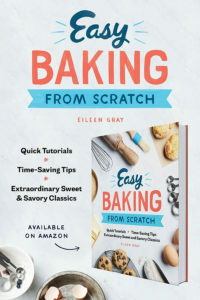 If working by hand stir in the flour with a wooden spoon until it's too thick to stir then turn the dough out onto a lightly floured work surface and continue kneading in the remaining flour. If working with a mixer, switch to the dough hook. Add remaining all purpose flour, 1/4 cup at a time. Knead the dough for 4 minutes until it forms a cohesive dough that clings to hook and clears the sides of the bowl. If working by hand knead for 5-6 minutes. Turn the dough out onto a lightly floured work surface and knead to form a smooth ball. Set the dough into a lightly oiled bowl, turning once to coat the dough. Cover the bowl and set aside to rise until doubled in volume, about 1 hour. Trim the edges to make a neat rectangle. Use a pizza wheel to cut the dough into 2"x2" squares, or to your desired cracker size. You don't need to pull the crackers apart. Use a fork to poke each cracker 2x. 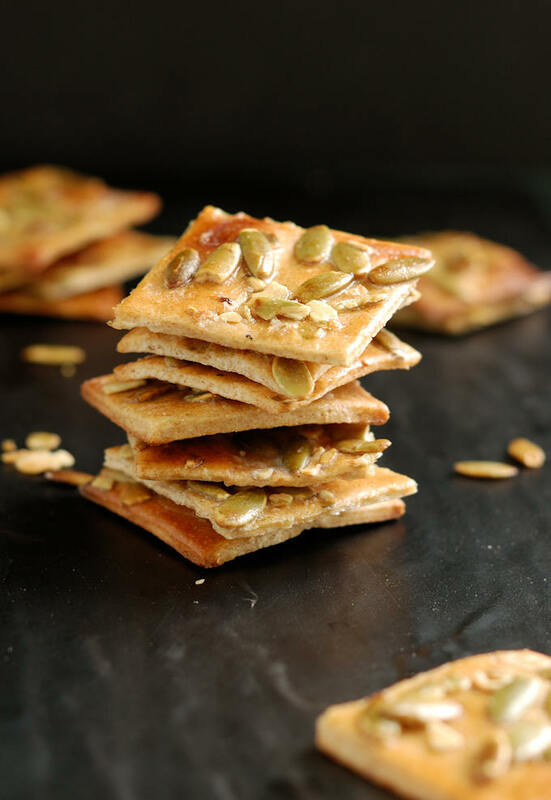 Brush the crackers with egg white and sprinkle with pumpkin seeds. Pat the seeds to stick them to the dough. Slide the paper onto a baking sheet and allow to rise while the oven preheats. Repeat with the other half of the dough. As soon as the crackers come out of the oven, brush with melted butter. Cool on a rack for 5 minutes. Break apart any crackers that are still stuck together. Cool completely. Stored in an air tight container, the crackers will keep for a week. If you don't have a 16"x 12" sheet pan adjust the size of the rectangle to your pan size, but still roll to less than an 1/8" thick.